As the Advisory Council on Historic Preservation commemorates 2018 Native American Heritage Month, ACHP Expert Member Dorothy Lippert of the Repatriation Office of the National Museum of Natural History, spoke with us about Native American involvement in historic preservation. Native American Heritage Month is important because it can highlight the issues facing Native Americans and give people a greater understanding of Native cultures and contributions. People who learn about Native culture during this month are then primed to understand or appreciate information they receive at any point during the year. 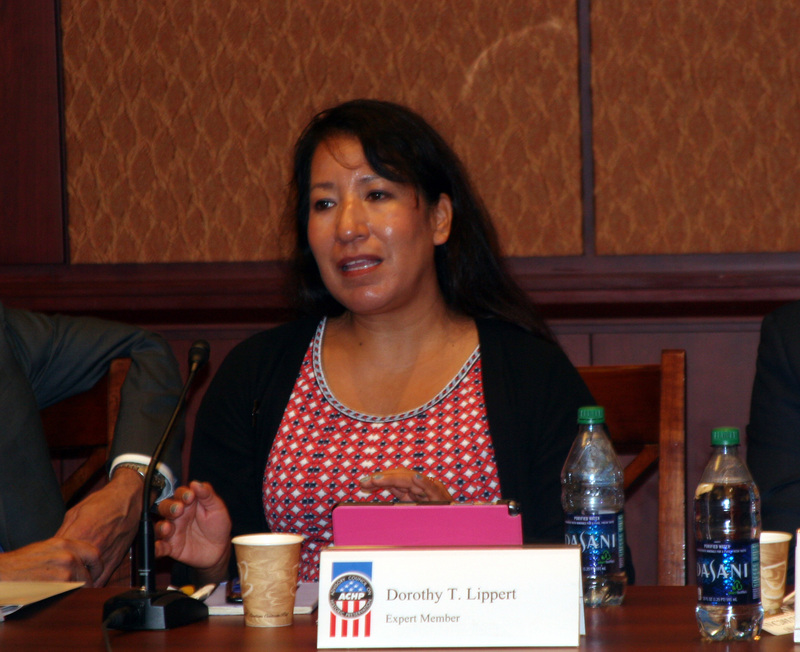 In essence, Native American Heritage Month can open a dialogue around heritage issues. Where do Indian tribes fit in the National Historic Preservation Program? Indian tribes are an essential part of the National Historic Preservation Program, in large part because our Nation sits on what was originally all Indian land. Tribes are tied to this land by roots that go back millennia. Because of this, tribal interests are inextricable from the interests of the National Historic Preservation Program. Tribes have the legal right to be consulted under Section 106 and it is vital that robust consultation take place. Sending letters is not consultation. Entities must be mindful of the rights of tribes as sovereign entities and of the unique nation-to-nation relationship that tribes have with the United States. What is the importance of Indian tribe’s historic properties to the country? Tribal historic properties are significant to the country because they can illustrate just how long the ancestors of U.S. citizens have been here in this place. Heritage sites like Chaco Canyon show the architectural brilliance and environmental knowledge that ancestral Native peoples had. The Cahokia Mounds were once home to the largest city in North America, with a population estimated to be near 100,000 at its peak. Archaeological investigations show the enormous extent of trade routes that existed in the Americas prior to European contact. The human qualities illustrated by these sites, such as interest in trade, engineering, agriculture, and community-building are qualities that are important to us as a nation. By learning about these sites, we understand more about the United States today and how we came to be here. Why are tribal sites and cultural resources important to Indian tribes? These sites aren’t just places to go and look at, or even places to learn from. For tribes, they are evidence of where we came from and remind us about our capacity to survive and thrive. My tribe, the Choctaw, have ties to a mound site in Mississippi. Nanih Waiya is the mother mound and it shows us where our homeland is, even though Choctaws now live all over the United States. Tribal cultural resources are a matter of responsibility for tribes. It’s not that we protect sites or resources solely out of a legal requirement; this is a deeply spiritual matter as well. Tribes may have cultural knowledge about a place that teaches them to protect it for the health of the community, or even for the health of the world. These responsibilities are deeply felt. What advice can you give to Indian tribes that want to be more involved in historic preservation? I would advise any tribe to get in touch with the ACHP’s Office of Native American Affairs. Valerie Hauser (ONAA Director) is wonderful to work with and is committed to working with tribes. I also would advise tribes to consider supporting tribal youth in careers in historic preservation fields. Although there’s a lot of preservation work that takes place with tribal resources, there are comparatively few tribal members who work full time in this field. If we encourage tribal youth, we can build capacity in the tribes to work with other historic preservation professionals. Do you have any suggestions that would improve tribal participation in the National Historic Preservation Program? Again, I encourage historic preservation professionals to work with tribal youth. I also encourage non-Native professionals to continue working with tribes even after projects are completed. Building lasting relationships can be a fundamental part of historic preservation work. Click here to learn more about the ACHP's observance of Native American Heritage month.